Who was the most influential person in your childhood? From the very earliest days that I can remember, my mother said, “I want to teach you some Scripture verses.” I couldn't have been more than four years old, and she taught me John 3:16. Every day was a different Scripture that she would read at the breakfast table. Then we would have a prayer. Either my father led the prayer, or usually in the early days, it was my mother. What type of discipline did your family use? The thing that I remember the most was the love of family and the discipline in the family. My father and mother both were disciplinarians, and they didn’t mind using the rod. Maybe because I was the oldest child I always felt I got much more of it than anybody else. Other than working for your family, did you have any paid jobs as a youth? Just after I graduated from high school in 1936, one of the former workers on our farm asked if I would be willing to join him in selling Fuller brushes through the summer. It seemed like a perfect way to make some money for college. As soon as I graduated from high school, we set out together. That summer’s experience selling Fuller brushes taught me a lot about myself, about human nature and about communicating a message to people. I had done well enough to earn as much as $50 or $75 a week - almost a fortune then for a teenager. And being away from my parents and learning to make my own way gave me self-confidence. What were your career ambitions as a child? Did you ever imagine that you would be in the presence of kings, queens and famous people? No, I never imagined anybody would ever come out to hear me preach. I’m just a country dairy farmer from North Carolina. As the summer after high school faded into fall, I kept asking myself, “What are you going to be when you grow up?” I was looking forward to registration day at Bob Jones College, but I still liked squatting on a milking stool in the cow barn. Did you ever participate or attend any special civic events, such as the Mecklenburg Declaration of Independence activities or the National Confederate Reunion in Charlotte, that were special and allowed you to see famous people? Of course Mordecai Ham was famous. If it can be outside Charlotte, what about meeting Babe Ruth, or meeting iconic preachers of the day while at Bible School in Tampa? Who were your closest friends in school in Charlotte? At the beginning of high school, my closest school friends were Sam Paxton, Wint Covington and Julian Miller. Although Bill McMakin, the son of one of our farm workers, was a couple of years older than me, he became my closest friend on the farm. The two of us did a lot of fishing and hunting together. My best friend was Julian Miller, and his father, a churchgoing man, was editor of the morning paper, the Charlotte Observer. What were your favorite places in Charlotte to date? Did you have access to a car? When I was in 9th grade, I started asking my father for our car to go to a basketball game, or maybe out on an evening date. Was anyone, who was not a minister, a spiritual encourager before you became a Christian? My mother taught Sunday School and sang in the choir at the church, but the Scripture calendar and things like that didn't come until maybe I was fourteen or fifteen years old. She had begun to read some magazines, like Moody Monthly coming out of Chicago and some of these magazines that had a little different emphasis than she had ever seen before, but she became very fascinated with [them]. They put an emphasis on the things that I preach today, including the Gospel in simple language and also taught about the Second Coming of Christ. It was a wonderful time to sit at my mother's feet because she became a wonderful Bible teacher. Why did you decide to go to Mordecai Ham’s revival, where you became a Christian? One day a few weeks into his campaign, I read in the Charlotte News about his charge regarding immoral conditions at Central High School in Charlotte. When the scandalous story broke, rumors flew that a number of angry students, on a night yet to be determined, were going to march on the tabernacle and demonstrate right in front of the platform. That stirred up my curiosity, and I wanted to go just to see what would happen. But how could I save face after holding out for nearly a month? That was when Albert McMakin stepped in. “Why don’t you come out and hear our fighting preacher?” he suggested. Albert added the incentive of letting me drive his old vegetable truck into town for the meeting. What were the main streams that encouraged your Christian development, such as movies, books, people, preachers, school, etc.? Some of the greatest values that have influenced me through the years are those that I learned as a boy growing up on the farm. I remember mostly the love in our family, but I also remember the discipline. Then there was the work; we all had to work. We got up in the mornings around three o'clock and went out to the barns to bring the cows in and milk. In high school I milked about twenty cows every morning and about twenty in the afternoon when I got home. I have wonderful memories from those early days when my parent's influence was so strong. I didn't realize when I married Ruth that I was getting such a remarkable family. Her father became my closest confidant and advisor for many years. And he was one of the greatest Christians I've ever known. My mother and my father and my father–in-law and mother-in-law were great influences, but certainly my wife has been the greatest. She was a woman of God. 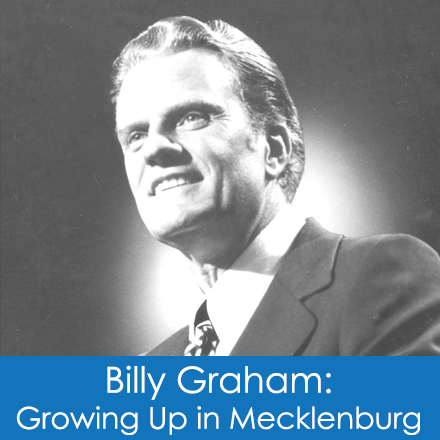 In 1958, after traveling the United States and the world as an evangelist, Billy Graham returned to Charlotte to hold a televised "crusade" in the Charlotte Coliseum. An hour-long video from this event may be found in the North Carolina Digital Heritage Center.